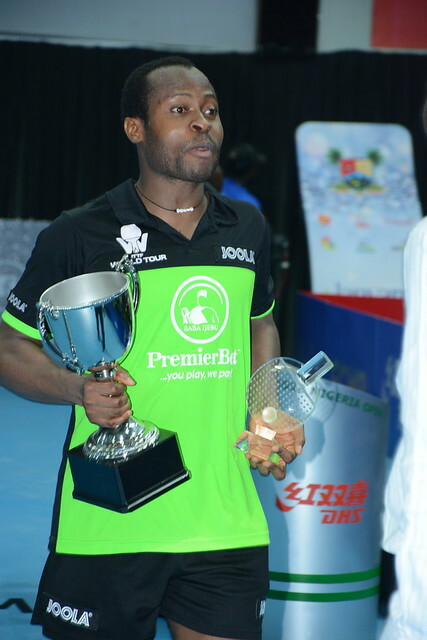 Assuming total harmony from the very first point Qi Fenjie and Sun Chen won the Women’s Singles title at the 2018 ITTF Challenge Seamaster Nigeria Open in Lagos on the afternoon of Sunday 12th August. In an all Chinese final between pair who had been required to commence matters in the two day qualification tournament, they overcame compatriots, Fan Siqi and Guo Yan in three straight games (11-3, 11-4, 11-6); a convincing result to say the least and not anticipated. The partnership formed by Sun Chen and Qi Fenjie was one rarely if ever seen on the international scene and I doubt ever witnessed in the history of the ITTF World Tour or the ITTF Challenge Series; both are right handed but Sun Chen is a pen-holder who uses short pimpled rubber on the forehand, reversed on the backhand. Conversely, Qi Fenjie is a defender, pimpled rubber on the backhand, reversed smooth rubber on the forehand; the combination mesmerised Fan Siqi and Guo Yan. They dominated the opening two games; Fan Siqi and Guo Yan had no answers; a surprising fact when considering they were playing against adversaries who are part of the same national team and who they knew well. In the third game it was very little different, Sun Chen and Qi Fenjie established an 8-6 lead, it was the closest that Fan Siqi and Guo Yan came. At 10-6 Sun Chen and Qi Fenjie held four match points, the opportunity was seized. It was the first ever final involving Chinese pairs at an ITTF Challenge Series tournament, since the concept became an entity in its own right as opposed to a constituent part of the ITTF World Tour. Furthermore, it was success for a unique pairing; one that underlines the fascination of table tennis, as the Chinese proverb goes: let a thousand flowers blossom. In Lagos at the 2018 ITTF Challenge Seamaster Nigeria Open, Sun Chen and Qi Fenjie blossomed.